The Precast/Prestressed Concrete Institute recognized 23 buildings and bridges throughout North America in its 2006 Design Awards Competition. Now in its 44th year, the program honored 12 buildings and 11 bridges, although some of those projects received awards from more than one judging panel. The total included two projects that received the Institute's highest nod for industry advancement, the Harry H. Edwards Award. Winning buildings included several highlighted for their attention to sustainable-design techniques, while three others won awards for their use of all-precast designs. Also winning were designs for a public library, a university stadium, a self-storage facility, an athletic center and several parking structures. Bridge winners included several all-precast concrete structures, three projects in categories divided by span lengths, two owner-designed bridges, two rehabilitated bridges and decorative sound barriers. Each year, the PCI Design Awards competition shows how designers are continuing to push the capabilities of precast/prestressed concrete components to achieve more cost-effective, aesthetically pleasing and quickly constructed projects, says James G. Toscas, PCI president. Precasters in turn are responding to these needs, as can be seen in several new products created by precasters in these winning entries that will aid the construction industry for many years to come. The Two Buckhead Plaza Office Building in Atlanta, designed by Corcoran, Nelson, Nardone Associates Inc. in Atlanta, with precast concrete components supplied by Tindall Corp. in Conley, Ga. The I-90 Bridge Over Door Creek in Madison, Wis., designed by Alfred Benesch & Co. in Kenosha, Wis., with precast concrete components supplied by Spancrete Inc. in Green Bay, Wis.
Detroit Opera House Parking Center in Detroit, designed by Rich and Associates in Southfield, Mich., with precast concrete components supplied by National Precast in Roseville, Mich. The Davis Narrows Bridge in Brooksville-Penobscot, Me., designed by the Maine Department of Transportation in Augusta, Me., with precast concrete components supplied by Strescon Limited in Saint John, New Brunswick, Canada. This project also was named a co-winner of the award for Best Bridge With Spans Between 65 and 135 Feet. Highmark Data Center in Harrisburg, Pa., designed by RTKL Associates Inc. in Baltimore, with precast concrete components supplied by The Shockey Precast Group in Winchester, Va., and precast specialty engineering performed by CEG-Illinois (Mount Prospect). This project also was singled out by the Buildings Jury to win the awards for Best Project Using Sustainable Design Techniques and the award for Best Manufacturing Facility, making it a three-time winner. 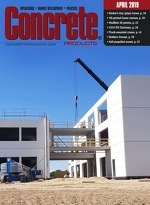 Flannery Construction Headquarters in St. Paul, Minn., designed by Roark Kramer Kosowski/Design in Minneapolis, with precast concrete components supplied by Hanson Structural Precast in Maple Grove, Minn.
Inter-Industry Conference on Auto Collision Repair (I-CAR) Headquarters in Hoffman Estates, Ill., Best Office Building. It was designed by Loebl Schlossman & Hackl in Chicago, with precast supplied by Lombard Co. in Alsip, Ill.
Augustus III multifamily development in Mexico City, Best Multifamily Housing Project. It was designed by Geo D.F. S.A. de C.V., with precast from Inpresa, Industrial Prefabricadora S.A. de C.V.
Santa Monica (Calif.) Public Library, Best Public/Institutional Building. It was designed by Moore Ruble Yudell Architects & Planners in Santa Monica, Calif., with precast supplied by Walters & Wolf Precast in Fremont, Calif.
South Spring Street Garage in Greenville, S.C., Best Parking Structure. It was designed by Craig, Gaulden & Davis Architects Inc. in Greenville and Carl Walker Inc. (engineer of record), with precast supplied by Metromont Prestress in Greenville, S.C.
Essex County Sportsplex Parking Structure in Newark N.J., Best Parking Structure. It was designed by Clarke Caton Hintz in Trenton, N.J., with precast from Nitterhouse Concrete in Chambersburg, Pa.
Lavalle Athletic Stadium at the State University of New York at Stony Brook, N.Y., Best Stadium Project. It was designed by Dattner Architects in New York, with precast supplied by Newcrete Products, a division of New Enterprise Stone & Lime Co. Inc., Roaring Spring, Pa.; Architectural Precast Inc., Middleburg, Pa.; and Oldcastle Precast Building Systems Division, South Bethlehem, N.Y.
Lock-Up Self-Storage Center in Skokie, Ill., Best Warehouse/Distribution Center. It was designed by Sullivan Goulette Ltd. in Chicago, with precast concrete components supplied by ATMI Precast in Aurora, Ill.
University of Cincinnati Varsity Village in Cincinnati, Ohio, Best Custom Building Solution. The architect of record was Glaserworks Inc., working with design architect Bernard Tschumi Architects in New York, with precast concrete components supplied by High Concrete Technology in Springboro, Ohio. County Road 453 over Battleground Creek Bridge in Coupland, Texas, Best Bridge with Spans Less Than 65 Feet. It was designed by the Texas Department of Transportation in Austin, Texas, with precast supplied by Heldenfels Enterprises Inc. in San Marco, Texas. Arapaho Road Bridge in Addison, Texas, Best Bridge with Spans Greater Than 135 Feet. It was designed by URS Corp. in Dallas, with precast supplied by Texas Concrete in Victoria, Texas. Arbor Road Bridge in Lincoln, Neb., Best Bridge with Spans Greater Than 135 Feet. It was designed by Tadros Associates LLC in Omaha, Neb., with precast supplied by Concrete Industries Inc. in Lincoln, Neb. State Route 148 / Mountain Stream in Lookout Mountain, Tenn., Best Owner-Designed Bridge. It was designed by the Tennessee Department of Transportation's Division of Structures in Nashville, Tenn., with precast supplied by Ross Prestressed Concrete Inc. in Knoxville, Tenn.
S. 317th Street HOV Direct Access Bridge in Federal Way, Wash., Best Owner-Designed Bridge. It was designed by the Washington State Department of Transportation, with precast supplied by Concrete Technology Corp. in Tacoma, Wash.
Monroe Street Bridge in Spokane, Wash., Best Rehabilitated Bridge. It was designed by David Evans & Associates in Spokane, with precast supplied by Central Pre-Mix Prestress Co. in Spokane, Wash.
Richmond-San Rafael Toll Bridge in Marin and Contra Costa Counties, Calif., Best Rehabilitated Bridge. It was designed by Ben C. Gerwick Inc. in San Francisco, with precast supplied by Pomeroy Corp. in Perris, Calif.
CSXT Bridge No. 23 Over St. Louis Bay in Bay St. Louis, Miss., as Best Non-Highway Bridge. It was designed by Ralph Whitehead Associates Inc. in Jacksonville, Fla., with precast supplied by Sherman Prestressed Concrete in Pelham, Ala., and Madison Materials Co. in Ridgeland, Miss. Maryland 216 Sound-Barrier Project in Howard County, Md., as Best Custom Transportation Project. It was designed by Whitman, Requardt & Associates LLP (WR&A) in Baltimore, with precast concrete components supplied by Concrete Safety Systems in Bethel, Pa. Rummel Klepper & Kahl in Baltimore served as the precast concrete specialty engineer, while the decorative form liners were designed and produced by Creative Design Resolutions in Brentwood, Md. The winning projects were selected by three panels of judges based on project type. The Special Awards Jury, handling the Harry H. Edwards and All-Precast Concrete Solution Awards, comprised Alex Mihaylov, project engineer at Berger/ABAM Engineers Inc. in Federal Way, Wash.; Jack Hartray, principal at Nagle-Hartray in Chicago; and Keith Allen, an associate with The Consulting Engineers Group in Mt. Prospect, Ill. The Buildings jury comprised Jerry K. Roller, national vice president of the American Institute of Architects and senior principal at J.K. Roller Architects LLC in Philadelphia; Vivian Manasc, president of the Royal Architectural Institute of Canada and principal at Manasc Isaac Architects in Edmonton, Alberta; and Young Chai, senior architect at Lucien Lagrange Architects in Chicago. The Bridge jury comprised M. Myint Lwin, director of the Office of Bridge Technology at the Federal Highway Administration in Washington, D.C.; William R. (Randy) Cox, director of the Bridge Division of the Texas Department of Transportation in Austin, Texas; and Michael L. McCool, chief bridge engineer with Bream, Longest & Neff LLC in Indianapolis.